The Awards were founded on the idea that individuals across every field of marine discipline are doing outstanding work—providing solutions to the challenges faced by our ocean, coastlines, and wildlife—and they need to be acknowledged and honored. Susi Pudjiastuti, the Republic of Indonesia’s Minister of Marine Affairs, was appointed by President Joko Widodo in 2014. Minister Susi has aggressively protected her nation’s economic and environmental interests by targeting the multi-billion dollar pirate fishing operations of foreign fleets. She has courageously and audaciously led the blowing up and sinking of more than 200 illegal fishing boats caught poaching— a strong deterrent to organized crime efforts that have invaded and overfished Indonesia’s biologically rich waters for years. She has been instrumental in the freeing of slave crews held on many of these foreign vessels, and she’s led the freeing of illegally trapped whale sharks. Her work has proved vital to protecting Indonesia’s unique and world-famous marine ecosystem while also providing important economic benefits and sustaining the livelihoods of tens of thousands of domestic fishermen, their families and their communities. Dr. Sumaila is Professor and Director of the Fisheries Economics Research Unit at the University of British Columbia. He received his Ph.D. from Bergen University, Norway, and holds a B.Sc. with honors from Ahmadu Bello University, Nigeria. Dr. Sumaila is deeply interested in how economics, through integration with ecology and other disciplines, can be used to help ensure that ocean resources are sustainably managed for the benefit of both current and future generations. His key recent contributions include 1) applying game theory to fisheries; 2) rethinking the nature of the discount rates applied in marine resource valuations, and formulating a highly original alternative, i.e., “intergeneration discount rates” 3) understanding the nature, amounts and effects of government subsidies on global fisheries 4) estimating the multiple benefits that would be obtained globally by rebuilding fish stocks and setting up marine reserves, including conceiving of the High Seas as a large marine reserve. His work is highly regarded by policy makers at the highest levels, resulting in invitations to give talks at the United Nations, the White House, the U.S. Congress, the European Parliament, the African Union, the British House of Lords, and the Canadian Parliament. Robin Alden, is the Founding Executive Director of the Maine Center for Coastal Fisheries (MCCF), Maine’s center for coastal fisheries based in Stonington, Maine. She co-founded the organization in 2003 with a vision of collaboration—doing the education, collaborative research and policy to bring together the knowledge and expertise of fishermen, scientists, and policy makers in the shared management of Maine’s coastal fisheries. MCCF’s focus is the most fishery dependent area of New England - the 150 miles of Maine coast from the Penobscot Estuary, east to the Canada’s Maritime Provinces and it works at state, regional and national levels to achieve its goals. Robin credits the urgent threat of climate change as an ironic motivator for spurring local, state and federal regulators to adopt new, more collaborative approaches to managing fisheries that include local fisherman and their unique knowledge in making tough, informed decisions. Under Robin’s direction, MCCFs innovative approach is internationally recognized as a model for sustainable fisheries. Robin has pursued this vision throughout her career: founding a regional fisheries newspaper, founding and running Maine Fishermen’s Forum, and as Maine Commissioner of Marine Resources. She is a recipient of the White House Champion of Change for Sustainable Fisheries. Wendy Benchley and Prince Albert II of Monaco. Even in a town full of titles (how many deputy undersecretaries does one government really need? ), a moniker like “his serene highness” gets attention. And so on Thursday night, the audience—which included a smattering of senators and other bigwigs—listened as Monaco’s Prince Albert II spoke after accepting a top honor at the annual Peter Benchley Ocean Awards, named after the creator of “Jaws.” The one-time bad boy bachelor has morphed into a downright proper royal, complete with a pair of just christened twins who’ve ensured his family’s line of succession in his bite-sized nation, devotion to environmental causes, and a knack for sweeping but soft-spoken oratory. “Oceans, in their beauty and mystery, unite human beings whatever their situation, nationality, or faith,” he said in his acceptance speech. We caught up with HSH briefly at the dinner following the awards at the Carnegie Institute for Science, where he munched on herbed risotto (definitely no Chilean sea bass for this bunch) and huddled with Benchley’s widow, Wendy Benchley. One question for the prince: What’s the obsession with royal babies about? Monaco's Prince Albert was honored at the Benchley Ocean Awards at the Carnegie Institution for his work in marine scientific expeditions on the ocean’s pressing challenges. Jeffrey Dubinsky Prince Albert is the only Head of State ever to travel to both poles. He's with Wendy Benchley, an ocean conservation and policy advocate, who co-founded the awards with Blue Frontier author David Helvarg in honor of her husband, Jaws author and oceans activist Peter Benchley; they've become the Academy Awards for the ocean. 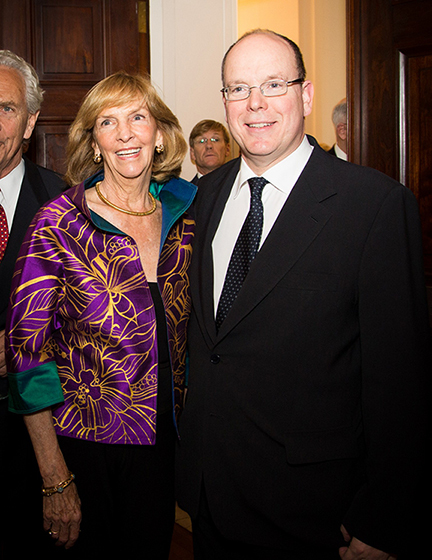 David Helvarg, Wendy Benchley, and Senator Ed Markey. Roger and Vicki Sant, Shari Sant Plummer and Daniel Plummer. Wendy Benchley (center) chats with H.S.H Prince Albert II and at left her granddaughter Cate Turner. H.S.H. Prince Albert II of Monaco took a day or two away from his royal twins to travel to Washington to personally receive a Peter Benchley Ocean Award at a ceremony that drew 300+ invited guests on Thursday night. Sen. Ed Markey presenting Secretary of State John Kerry's award to undersecretary Catherine Novelli. For his leadership to save the seas, Prince Albert was honored with the “Excellence in National Stewardship of the Ocean.” The award was presented by Dr. Enric Sala, National Geographic Explorer-in-Residence and founder of The Pristine Seas project. The Peter Benchley Ocean Awards, now in its 8th year, was founded by Wendy Benchley and David Helvarg, author and executive director of the Blue Frontier. The world’s preeminent ocean honors are named after the late author of “Jaws” and lifelong marine conservationist Peter Benchley. This time Jaws lives on with a touch of royalty. Prince Albert had an especially busy week but was relaxed and affable during a full day of speaking activities discussing environmental subjects, first at the National Geographic, then in the evening going over to the Carnegie Institution for Science for the Benchley awards. The Prince lingered at the VIP reception, which was packed with ocean advocates from Hawaii, British Columbia, Australia, California, North and South Carolina to Massachusetts, and the list goes on. Monaco's Prince Albert II flanked by Dr. Sylvia Earle and Dr. Enric Sala. “The world needs your passion and your energy,” Prince Albert told the National Geographic audience. Too often, he said, “we don’t put a street light at a crossing until there’s been an accident. We don’t want to get to that point for the oceans.” On Sunday, May 10, Prince Albert and his wife, Princess Charlene, baptized their 5-month-old twins in services in Monaco.